Fino International said on Sunday it was nearing the end of its 33 month project to fit out the Burj Khalifa’s corporate offices, public lobby and Armani Hotel & Residences. Talal Saeed, the company’s managing partner, described the AED400 million contract as the most “enlightening” he has ever worked on. “The specification in the job is one of the highest I have ever seen and experienced; it was a most enlightening experience due to the fact there are so many consultants supervising and reporting to each other to make sure that everything is coherent and works perfectly together,” said Saeed in comments published by Hotelier Middle East. Fino’s work on the project covered three separate areas. The largest was the fit-out of the Armani Residences and the Armani Hotel Dubai, which required painstaking attention to detail and close co-ordination with teams from Armani and Emaar Hotels. The second part of the work was the tower’s public area, which included the main entry lobby, the Armani café, various restaurants, prayer areas, a health club and spa. The third part of the contract was the corporate offices and the private offices of Emaar, on levels 152-154. During the fit-out process, materials such as marble, onyx and gypsum were sourced from all over the world, treated in Italy and shipped to Fino in Dubai for cutting and jetting prior to installation. 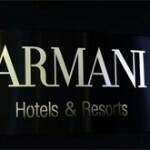 A brand new type of paint, developed by Armani with the help of an Italian student living in the UK, had to be used throughout the Armani properties. Fino International started the job with around 300 people on site, a figure that rose to around 2,500 people at peak times. Around 30 percent of those people were new hires. 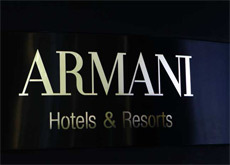 Armani Hotel Dubai will open on March 18. Handover of apartments in Armani Residences will begin in February. Next articleBurj Dubai is Finished, But at What Environmental Value?